For over half a century Mexico and Japan have enjoyed a storied rivalry which has grown stronger in recent years. Remarkably, almost 150 world title fights have been contested between prizefighters from those countries during the modern era. Both nations have certainly had their successes and this Saturday Jaime Munguia and Takeshi Inoue clash for Munguia’s WBO junior middleweight title as hostilities resume. The 154-pound showdown will be streamed live in the U.S. on DAZN. Munguia-Inoue headlines a Golden Boy Promotions card at the Toyota Center in Houston, Texas. It will be the first Mexico vs. Japan world title bout to take place above welterweight. In the thick of his prime Saldivar met durable Japanese challenger Seki in a battle of aggressive southpaws. Saldivar, 23, recovered from a fourth-round knockdown to edge a close but unanimous decision. The fight was deemed so close they met in a rematch and Saldivar showed his greatness, stopping Seki in seven. Three years earlier Olivares had demolished Kanazawa in two rounds. However, the rematch turned out to be a lot more difficult. Olivares and Kanazawa fought on close to even terms before the champion’s vaunted power took. Olivares dropped the challenger three times in the 14th round to secure the knockout. Gushiken turned back the valiant challenge of the unheralded Flores, edging the Mexican in a close back-and-fourth encounter. However, the pair met in a rematch five months later and Flores took Kanmuriwashi’s [Fierce Eagle’s] unbeaten record and title via 12th-round stoppage. Roman used his impressive jab and movement to give Watanabe fits. The fight turned out to be competitive, but Roman’s skills paid dividends and he claimed the title in front of a pro-Watanabe crowd in Japan. In what would turn out to be the final win of the future Hall of Famer’s career, Zaragoza granted the hugely popular Tatsuyoshi a rematch after stopping him in 11 rounds one year earlier. Again the champion travelled to Japan and both fighters gave their all, but it was Zaragoza who got the best of it, claiming a well-earned unanimous decision. Novice pro Nashiro unseated Castillo in a hard-fought encounter. Both men had their successes, which was reflected in the scorecards; Nashiro 87-85, Castillo 87-85 with the third judge unable to split the pair at 86-86. However, referee Guillermo Pineda stopped the fight due to a deep cut over Castillo’s left eyebrow. Nishioka recovered from a first-round trip knockdown to drop Gonzalez heavily with a huge overhand left that put the stricken fighter flat on his back. Gonzalez rose gamely, but he was on unsteady legs which forced the referee to stop the contest. Long-reigning WBC titleholder Hasegawa enjoyed the better of the early going against his WBO counterpart from Mexico. The WBO belt wasn’t at stake because at that time the Japanese Boxing Commission didn’t recognize the organisation. Suddenly, late in the fourth frame, Montiel uncorked a howitzer of a left hook that hurt Hasegawa badly. The defending champion retreated to the ropes and Montiel unleashed a barrage of punches, forcing referee Laurence Cole to intervene. In a rare unification matchup in boxing’s lightest weight class, both men fought each other to a standstill over 12 fast paced rounds. Rodriguez, known as “El Chihuas”, dropped Takayama in the third, but the tough Japanese fighter responded well and had success in the middle rounds. Both men stood toe-to-toe down the stretch and fought at a frenetic pace. The younger man edged matters by hard fought unanimous decision. Miura looked on course to retain his title when he dropped Vargas in the fourth, however, the Mexican looked ready to be stopped himself ate in the eighth. Miura was ahead on two scorecards entering Round 9, but a heavily marked up Vargas came roaring back and dropped the defending champion with a fusillade of punches to secure a stunning title win. Vargas-Miura would be named The Ring “Fight of the Year”. Honorable Mentions: Efren Torres UD 15 Susumo Hanagata, Takashi Miura UD 12 Sergio Thompson and Hozimi Hasegawa RTD 9 Hugo Ruiz. 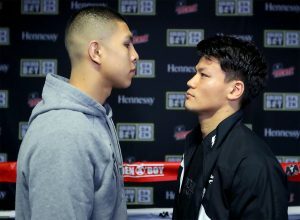 Jaime Munguia vs. Takeshi Inoue, plus undercard action, will be broadcast live and exclusive on DAZN. The post Jaime Munguia-Takeshi Inoue world title clash to continue famous Mexico-Japan fight rivalry appeared first on The Ring.